No one ever tires of the beauty and sparkle of winter. If you’re planning a gathering for family and friends a Christmas Winter Wonderland offers all the joys of the season. There are as many invitation possibilities to a Winter Wonderland party as there are snowflakes! Snowflake Invitation - A flurry of snowflakes are perfect for a Winter Wonderland Christmas Party! 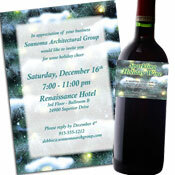 Holiday Lights Invitation - Snow, pine and Christmas lights set the scene for a perfect winter theme invite. Winter Wonderland Snow Theme Invitation - Your guests will feel like they are walking though snow covered trees in a winter wonderland! You can add a little winter sparkle to the invitation by throwing in a pinch of iridescent snow into the envelope. Like to design your own invitations? Cut out snowflakes (ask a young friend if you forgot how to do it), decorate with silver and gold glitter pens and write the party details on the back. This is one invitation that will still be hanging up long after the party’s over. Another creative way to make a handmade invitation is to take a picture of your family doing something in the snow (making snowmen, creating snow angels, catching snowflakes on your tongue) and attach a copy of the picture to a piece of heavy cardstock. Write a message underneath your picture "Come join the Smith Family in this Winter Wonderland", and you can write out the party details on the back. There are so many great choices for decorations and party supplies for Winter Wonderland that the hard part is picking the right ones for your event. Snowflake Linky Balloons - Link these great Mylar balloons together to make a wonderful arch for your entrance or for over the buffet! Banners - You can go with a custom winter theme banner that has a personalized message. Have your message say something like "Happy Holidays from the Smith Family", and you can leave it up all season. Snowflake Ceiling Decorations - Hang these beautiful large snowflakes from the ceiling! Try them above the buffet, dancefloor, or over each table in lieu of a centerpiece. Winter Balloon Tree - Add this dramatic decoration to your party to wow your guests! You can use them to flank an entrance or to create a stunning focal point. Snowflake Centerpiece - These simple centerpieces will look great surrounded by votive candles. Snowflake Burst Centerpiece - Real snowflakes might be "frightful", but these snowflakes are delightful for the table! Sprinkle snowflake confetti on the table for a little extra decoration. Catering to a younger crowd? Think about scattering winter Funtoos (temporary tattoos in winter designs) on the tables as well. The kids will have a great time decorating themselves. You can make silverware bundles (great if you are having a buffet) by wrapping silverware in napkins and then tying them off with blue or white ribbon. Speaking of buffets, if you are having one make sure to decorate that as well. A balloon bouquet or two will do the trick! There is so much shopping for the holidays that your guests will be thrilled to leave your party with their own presents. Favors are perfect for saying "Thank you for coming". Winter Theme Candy Bar - Set one at every place setting, or have them by the door for guests to grab on the way out. Additionally, set out single serving sized bottles of milk or bottled water to go with the chocolate. Car Ice Scraper - Add a tag that reads "It was so ICE of you to party with us!" Personalized Mint Tins you can personalize it with your own wording and candy choice! Tie a tag on the favor that says "Thanks for coming to frolic and play in this Winter Wonderland!" Have a wonderful time in your winter wonderland, and a have a Merry Christmas!